The PC gaming platform Steam has a ridiculous number of games on it. Like, more than ten.1 This makes finding new games difficult if your tastes are even slightly off the beaten path. To help with this, Valve has implemented what it calls a Discovery Queue. Steam’s Discovery queue explained. Click to embiggen. 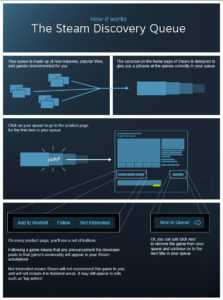 The idea is similar to other recommendation engines that you find on Netflix or Spotify. Steam gathers some information about you, tracks what you play and purchase, sees what your friends like, then uses The Maths to assemble a queue of games that it thinks you will like. Neat! You can then “explore” your queue and get a sample of what’s in it –and maybe make a purchase perhaps you like this game yes? It’s a good idea but as with all such recommendation engines a lot hinges on how much users believe that the algorithm has good insights into what they like. And that in turn depends on whether we think we like what it’s recommending. But, being sacks of meat piloted by a simple brain in a bone jar, we can sometimes be influenced by how these kinds of recommendations are presented and framed. In one study, Harvard’s Daniel Gilbert and his colleagues explored how this kind of subjective optimization can be hijacked to make people more likely to think that a recommendation system like the Discovery Queue is more insightful than we might otherwise give it credit for.3 The researchers told participants that they were working on highly experimental “SmartRadios” for cars that would intuit what music listeners would enjoy based on previously collected personal information. Then it would automatically change the radio station to maximize their listening experience. This is a concept made mundane by modern streaming services like Spotify, but it must have seemed almost magical in the year 2000 when the study was published. The difference, you can see, is in the order of steps 3 and 4. In the control condition people were able to listen to samples and form their own opinions before learning which one the SmartRadio had chosen for them. Because of subjective optimization, people in the experimental condition tended to like the song that was chosen for them. And because they thought they liked the chosen song more, they thus reported stronger convictions that the SmartRadio had legit insight into their preferences. This was in contrast to a control group, where subjects heard song samples before being told which one the computer thought they would like better. In that case, people made up their mind before hearing the SmartRadio’s suggestion and then resisted changing it when told what the computer thought. To put it in even simpler terms: people more readily formed new opinions than they changed existing ones. And if they thought an external agent (the SmartRadio) agreed with their opinion, they were more likely to ascribe insight to it. Screen 1 gives the user the names of two games: Game A and Game B. Screen 1 also tells the user that the Steam Hive Mind really thinks she is going to like Game B. The recommendations for Game A and B can be true. They should be true! Game A really can be something that the algorithm doesn’t think the user will like, or will like as much. Game B really can be something they should like. But this sequencing of events should be more likely to trigger subjective optimization in favor of Game B. 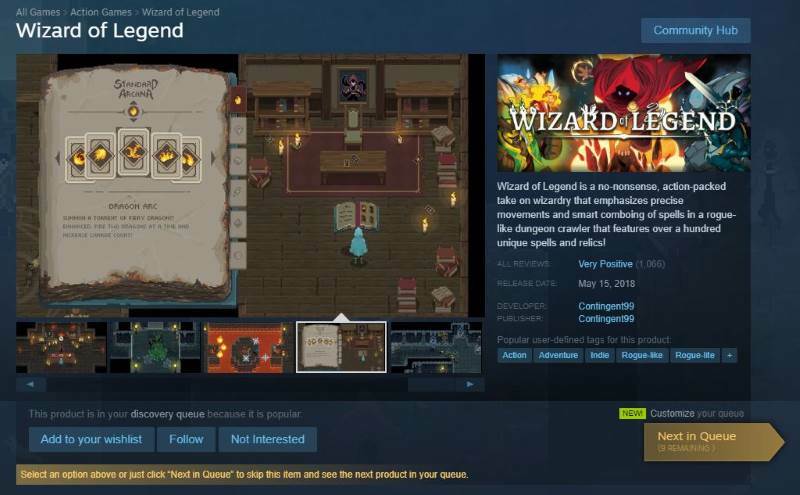 If Steam really wanted to use this to kickstart people’s perceptions of the Discovery Queue’s insights, they could offer the recommended game for free or even just at a discount. Since people will then have a stronger expectation of getting the game, their subjective optimization should be more likely and more pronounced. Heck, this might be the perfect setup for the next big Steam sale where they’re going to be marking down a ton of games anyway. I think I would like this. 1. Feel free to double check my math. 2. For an overview of this phenomenon, see Gilbert, et al. (1998). Immune neglect: A source of durability in affective forecasting. Journal of Personality and Social Psychology 75, 617-638. 3. Gilbert, D., Brown, R., Pinel, E., Wilson, T. (2000). The Illusion of External Agency. Journal of Personality and Social Psychology 79, 690-700. It’s great that Steam is offering Discovery Queue, so it’s easier for users to discover games that fit their interests! I can’t wait to update my computer so I can enjoy the games that they offer. Once my computer meets the minimum requirements, I’ll be using their search to find the perfect games for me! With the updates, hopefully the searching and downloading will be much faster, so I can get to gaming ASAP! Sounds like a good way to boost indie games.